Hello and welcome to Decor Gold Designs! If you are coming from Randi Garrett Design, thank you! 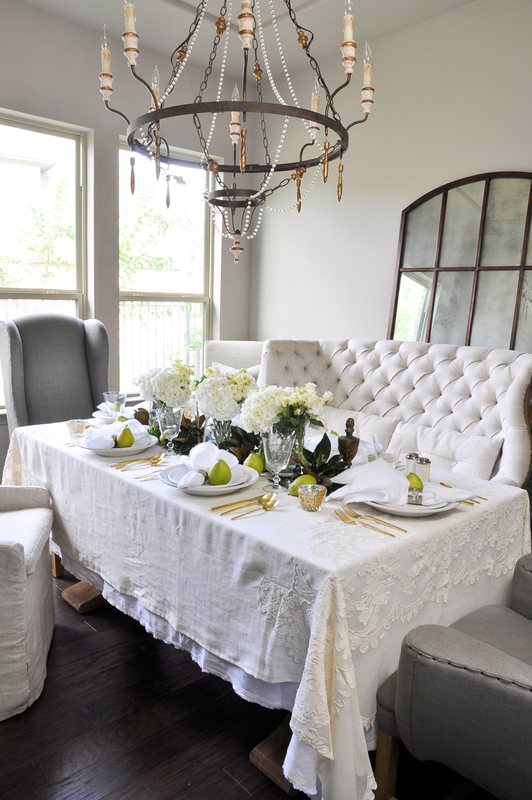 Randi’s table is simply gorgeous and if you haven’t seen it yet, you’ll find a link at the bottom of this post that will take you directly there. We’re incredibly excited to share our holiday tables with you today and we will both be featuring lovely Pom Pom at Home linens. 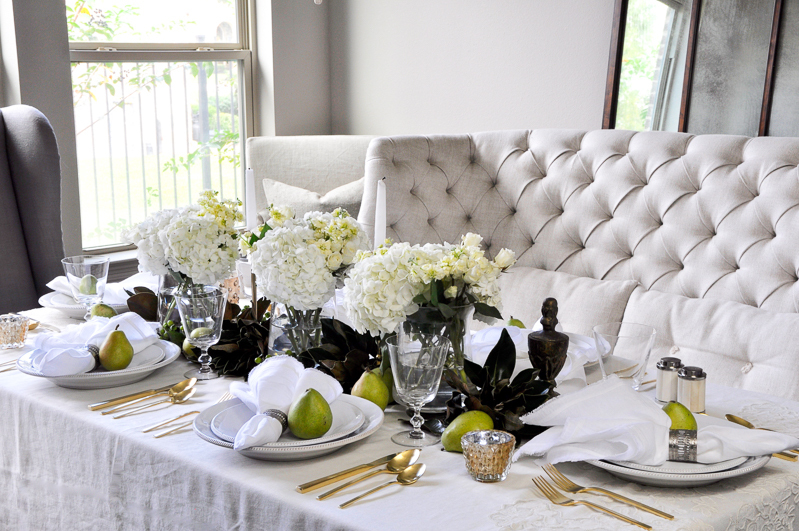 One of the most important components of appropriate table decor is linen. 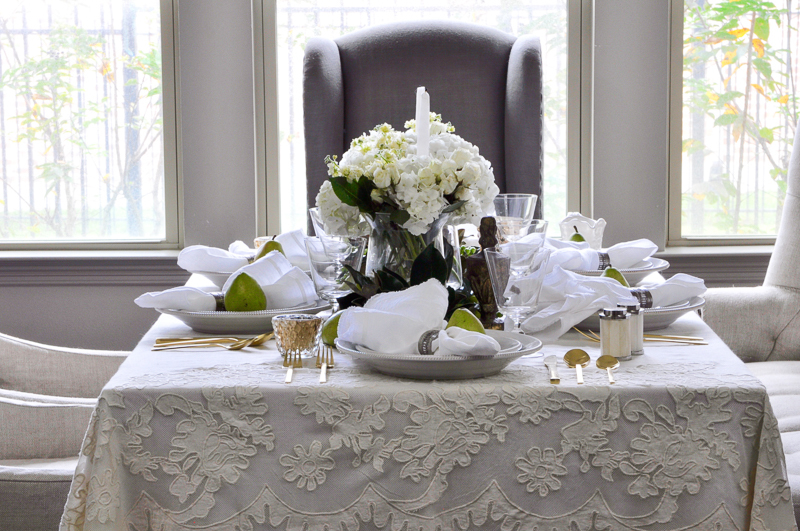 When you make the choice to invest in beautiful linens, from table covers to napkins, you begin to set your table apart. These types of investments lend themselves to being passed down to your children. Maybe even your grandchildren. This type of fabric is special and it elevates your design. Read about my love for linen bedding here. I started with layer tablecloths, but we’ll get back to that later. For the centerpiece, I decided to create a garland. 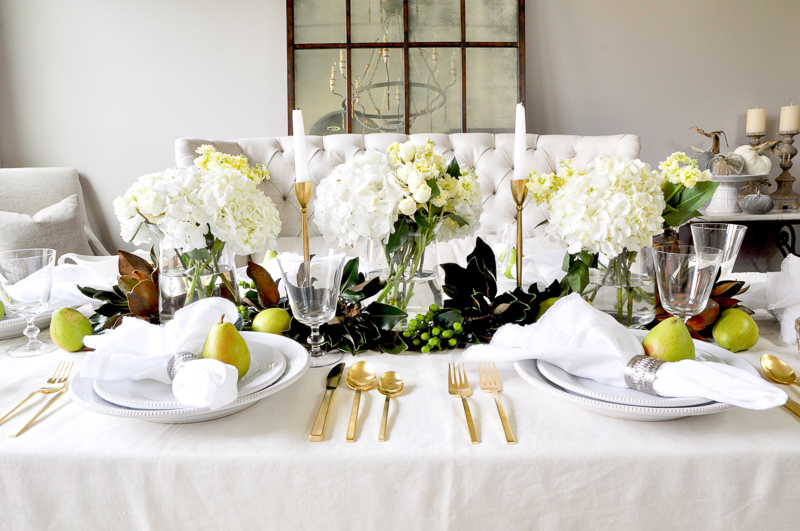 It is monochromatic for an elegant look and I used magnolia leaves, green berries, and pears. I added white floral arrangements to complete the timeless design. I also added slender gold candlesticks. 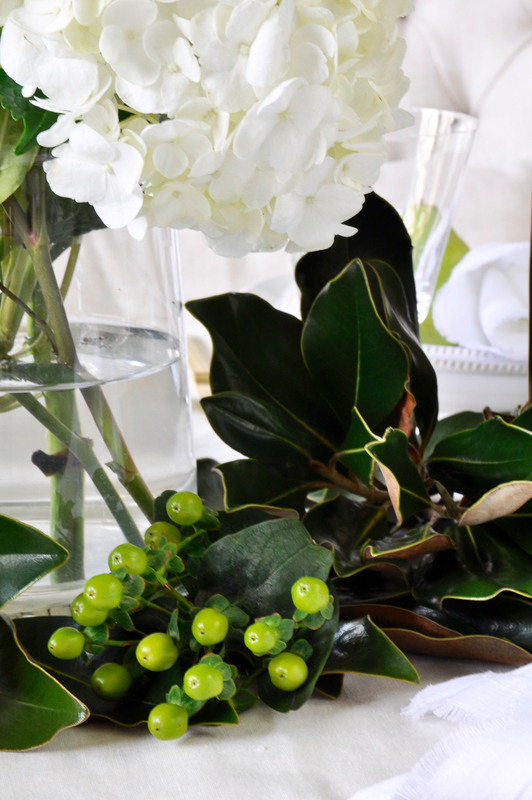 The magnolia leaf garland was made by placing single leaves down as a base while adding branches with 7-10 leaves on top for height. The flower vases are short enough to allow for easy conversation. But, if you prefer, you can remove them for dinner and the remaining garland makes a beautiful centerpiece. 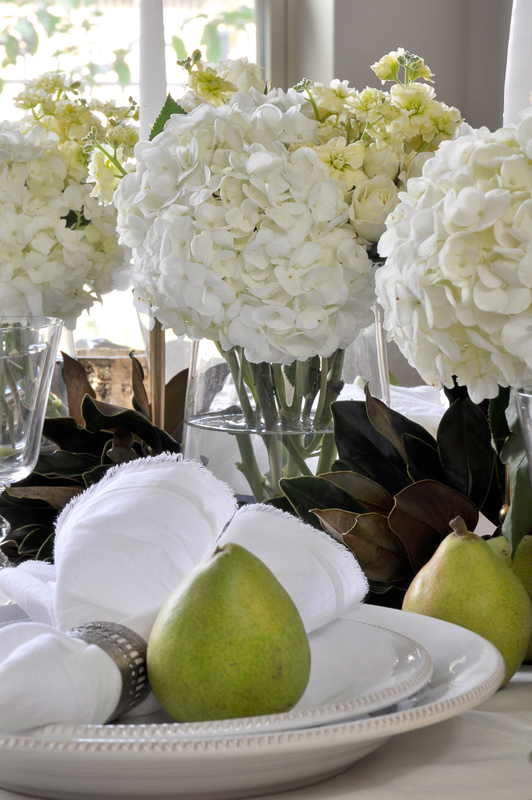 The place settings include a pear for color. 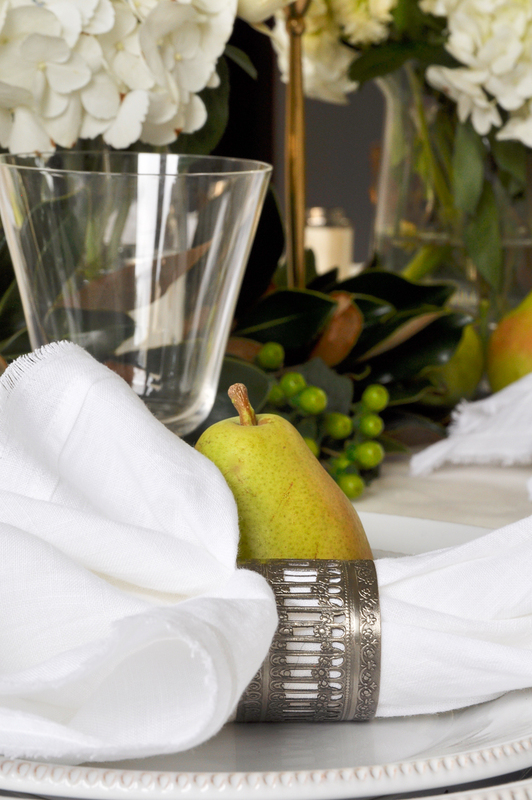 Fruit is a beautiful and inexpensive addition to any tablescape. 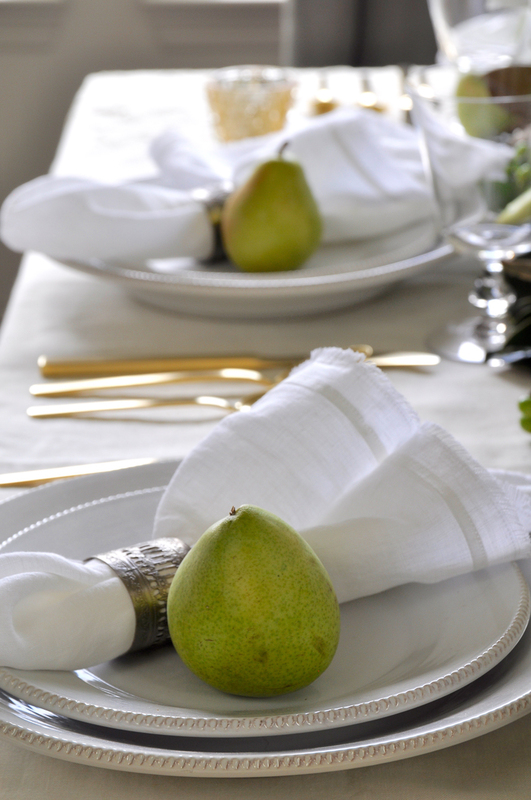 I chose simple dinnerware, these lovely white linen napkins and gold flatware for a elegance. 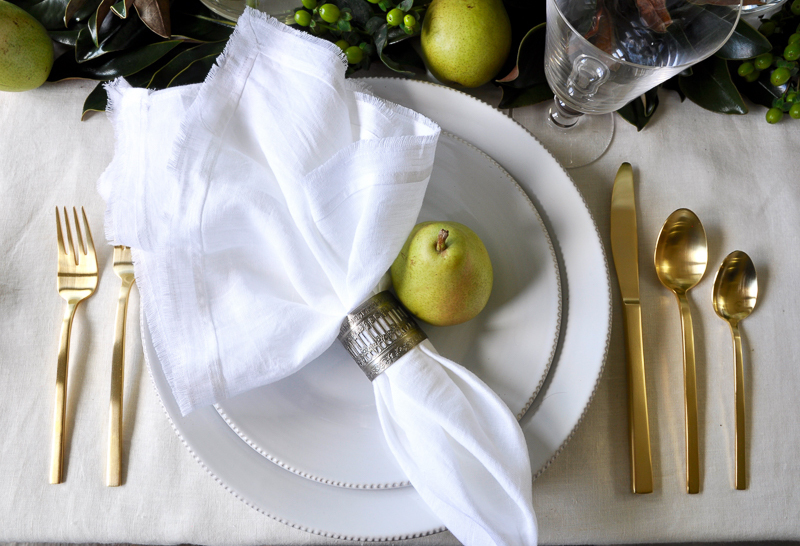 The silver napkin rings work beautifully with the gold flatware. I love the details as well as the contrast in color. Don’t be afraid to mix metals. It is perfectly acceptable and provides interest and beauty. 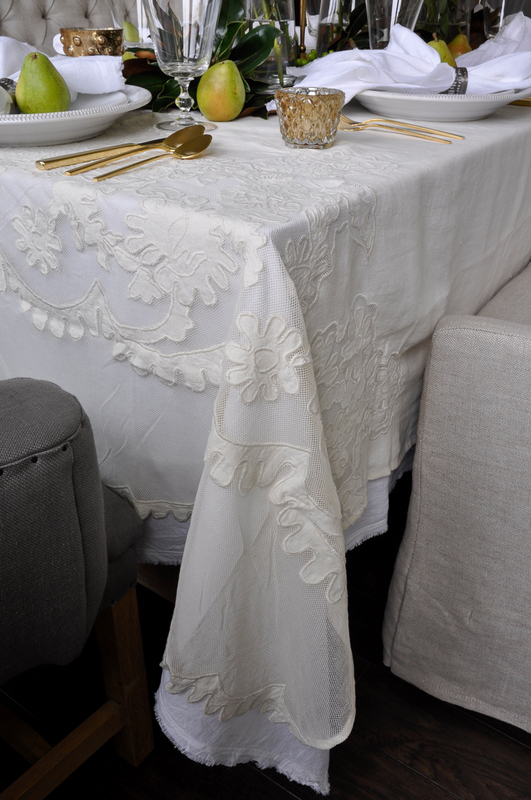 I layered my tablecloths for richness. The top one provides a feminine elegance. 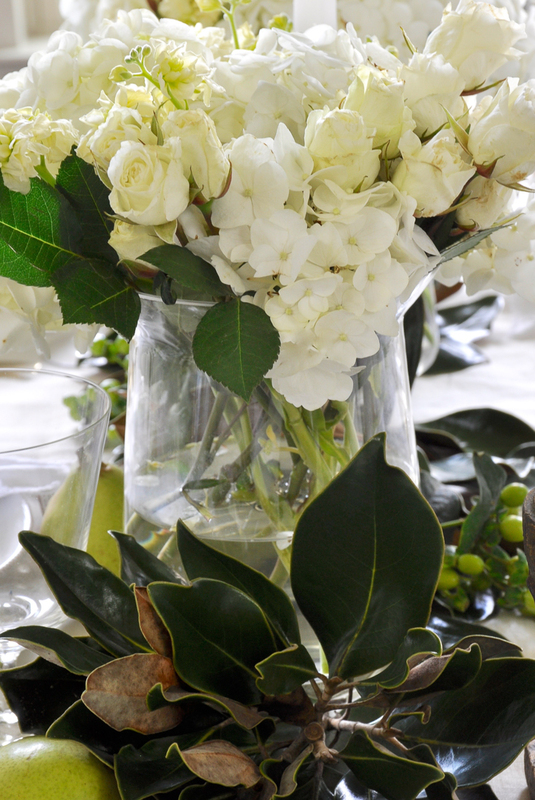 As you can see, creating a beautiful tabletop for your guests to enjoy doesn’t have to be complicated. 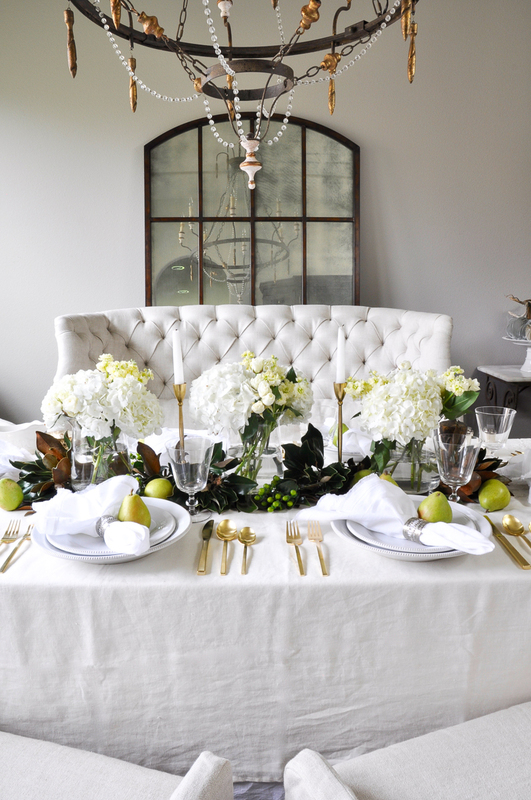 All of the components come together for a table that could easily be used for any fall or holiday gathering. 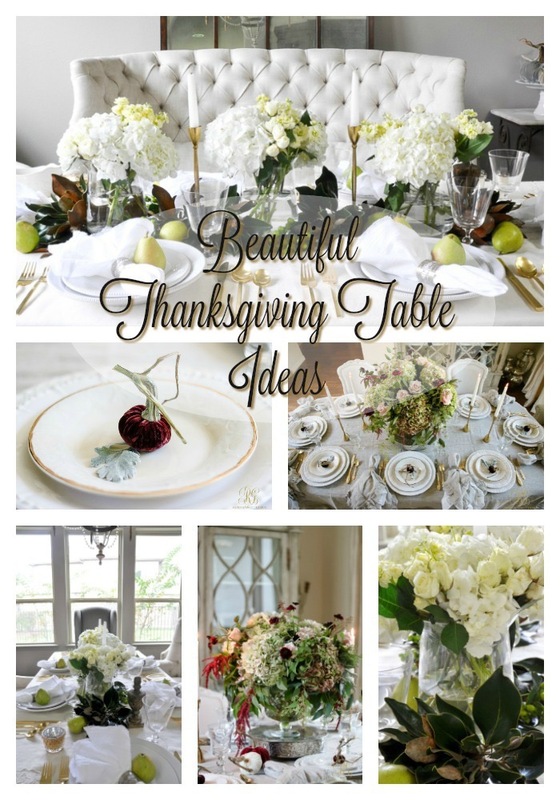 I hope this inspires you to create a beautiful holiday table for you and your family. I have also shared another Thanksgiving tablescape here. You can find all sources below and at the bottom of this post. For additional inspiration, I have linked to my dear friend Randi of Randi Garrett Design. 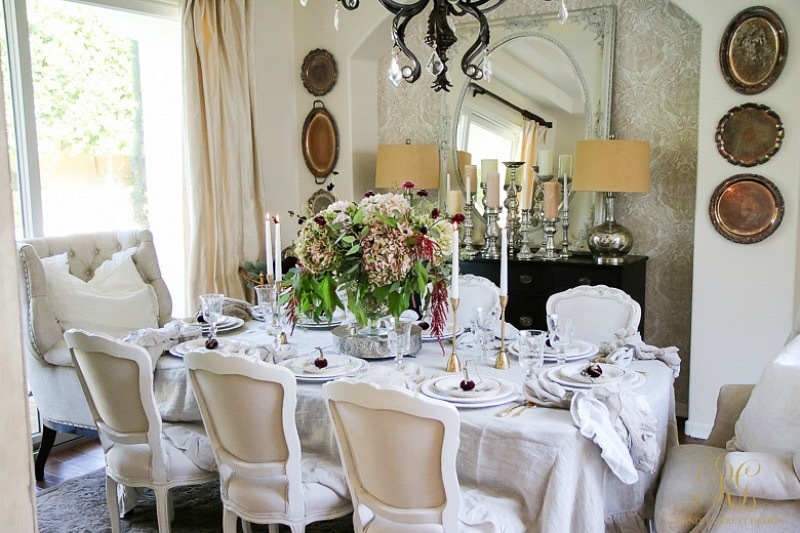 She has impeccable taste and has used Pom Pom at Home linens for another Thanksgiving look for you to enjoy. Thank you again for visiting Decor Gold Designs and Happy Decorating! Similar items have been substituted in some cases. You can find additional items on my Dining Room Sources page. 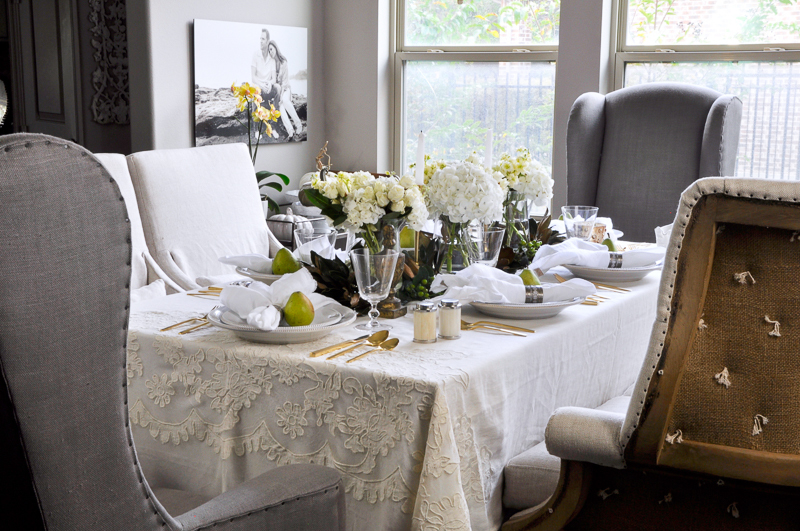 To see a full tour of my Dining Room, click here. Here’s a sneak peek of Randi’s Thanksgiving table. Isn’t it amazing? I hope you will take a moment to visit her website. Also, be sure and watch for our Christmas tables which will be coming soon! *This post was done in partnership with Pom Pom at Home, but all of the opinions shared here are my own. Bree, thank you! I love using magnolia leaves and I can’t wait to see what you’ve done with them!!! Jen, every single component is amazing! 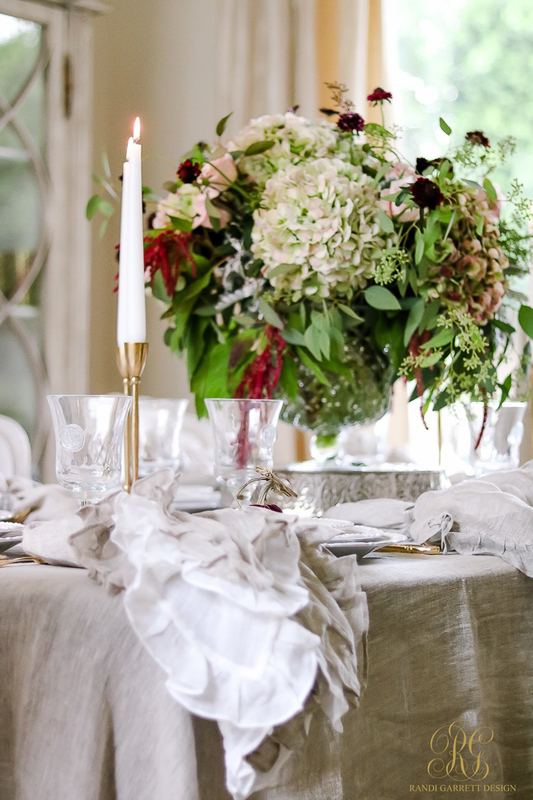 Love your color scheme and your layered linens. I am seriously needing some new ones and yours are GORGEOUS! Thank you for the awesome inspiration!! Kelley, you are so sweet! You know I love you! Thanks!!! I love the clean, elegance of this look. Very timeless. Thank you so much Desiree! So kind of you!